Reading all the books and reviewing them! Rowan has gone rogue, and has taken it upon himself to put the Scythedom through a trial by fire. In the year since Winter Conclave, he has gone off-grid, and has been striking out against corrupt scythes—not only in MidMerica, but across the entire continent. He is a dark folk hero now—“Scythe Lucifer”—a vigilante taking down corrupt scythes in flames. Citra, now a junior scythe under Scythe Curie, sees the corruption and wants to help change it from the inside out, but is thwarted at every turn, and threatened by the “new order” scythes. Realizing she cannot do this alone—or even with the help of Scythe Curie and Faraday, she does the unthinkable, and risks being “deadish” so she can communicate with the Thunderhead—the only being on earth wise enough to solve the dire problems of a perfect world. Will it help solve those problems, or watch as perfection goes into decline? After an incredible first book in the series Citra, Rowan and the other scythes are back in Thunderhead. The sequel begins with the scythes at a tipping point with the new order and their unique ways of gleaning as well and Rowan now being an enemy of the Scythedom. Citra, now an official Scythe, is a force to be feared but also an enemy to powerful people that won’t stop until she’s eliminated. Also, the Thunderhead is becoming more aware of the issues of mankind and feels a need to do something. So, Thunderhead was incredible! I’m going to be in shock for awhile as I wrap my head around what just happened in those final few chapters! That was explosive and earth-shattering. Just as I predicted, the sequel to Scythe fulfilled my expectations and went above and beyond. This was another incredible book in this unique and creative series and I definitely recommend this series to anyone who loves surprises. I’m constantly shocked by the ways this book keeps going in unexpected ways and every time I think it can’t get better it does! I loved the storylines of the main four characters that interacted with each other and usually, I’m not a fan of new characters introduced in a sequel but I adored Grayson. He was a smart and loveable person who had such an impact on the story and I was very glad for it. I also identified with Munira and I was super jealous of her job at the rebuilt Library of Alexandria with all the handwritten journals of every Scythe, what a dream job! Basically, I loved this book more than I thought it could love a book and I have no idea what is going to happen in the third book after that astounding ending to this one. 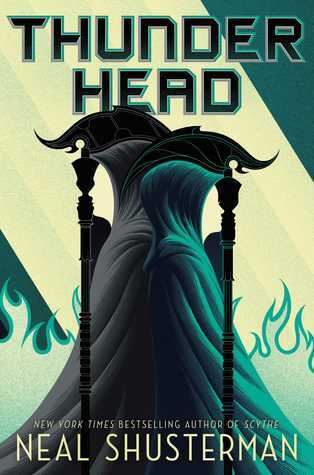 Let me know your thoughts on Scythe or Thunderhead if you’ve read them! i’m so ready for this book! Great review! Thank you, it was seriously non-stop fantastic action and mystery throughout!